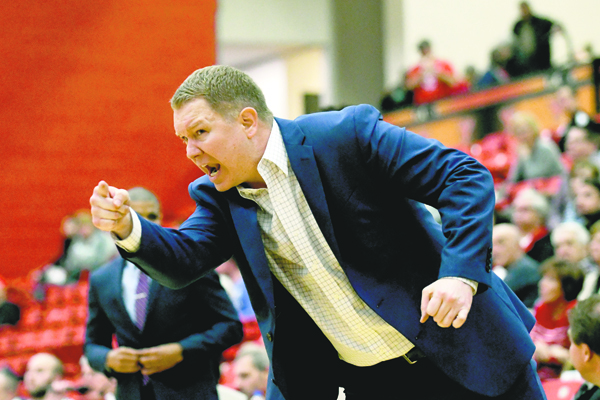 Special to Tribune Chronicle / Robert Hayes Youngstown State University men’s basketball coach Jerrod Calhoun yells instructions to his team during their game with Milwaukee on Thursday. The Penguins won, 72-71, on a 3-pointer at the buzzer by Garrett Covington. 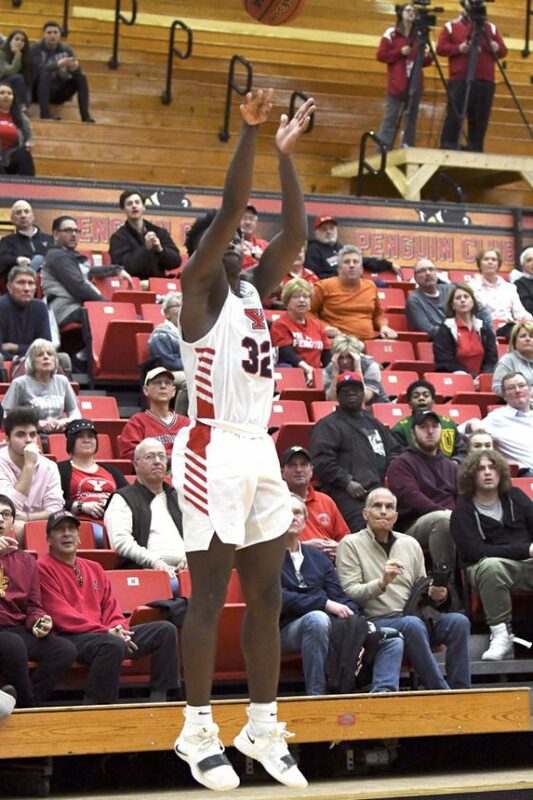 Special to Tribune Chronicle / Robert Hayes Youngstown State’s Garrett Covington releases the game-winning 3-pointer at the buzzer on Thursday at the Beeghly Center in Youngstown. YSU won, 72-71. 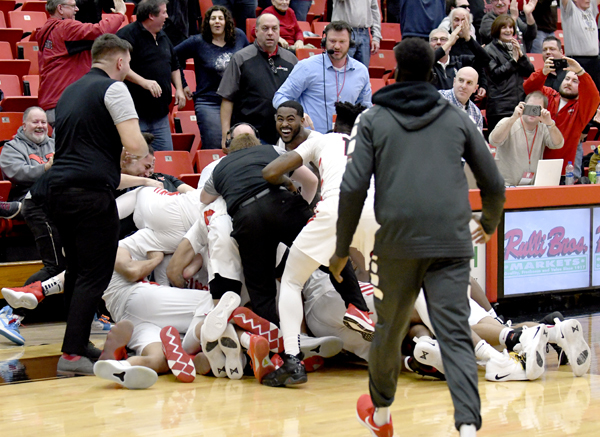 Special to Tribune Chronicle / Robert Hayes Youngstown State players dive on top of Garrett Covington after the sophomore hit a game-winning 3-pointer at the buzzer on Thursday at the Beeghly Center in Youngstown. YOUNGSTOWN — Darius Quisenberry took the inbounds pass in front of the Milwaukee bench. The fate of this Youngstown State University men’s basketball team would be in its freshman point guard’s hands. The Penguins would have it no other way as the ball entered play with 5.5 seconds remaining, trailing by two points. He’s the same one who sparked the last two wins at Oakland and Detroit. The Springfield native started to drive when he saw two Milwaukee post players collapse the lane past the Penguins bench. This time, he didn’t go to the basket as he’s done so many times in his young career. He bounced a pass to a wide-open Garrett Covington in the corner. The sophomore wing from Carmel, Indiana, saw the ball come to his hands and he shot a 3-pointer from the southwest corner of the Beeghly Center. The ball left his hands before the red, glowing light surrounded the clear backboard and the final horn reverberated around the building for Thursday’s 72-71 win over Milwaukee. This was the second buzzer-beating shot for Covington in his YSU career. The first came almost a year ago on a putback to beat Oakland on Feb. 14, 2018. The team converged near YSU play-by-play voice Robb Schmidt, a Warren G. Harding High School graduate, and piled upon Covington in celebration, but that was after an abbreviated delay by the officials to make sure Covington’s shot was out of his hands before the final horn sounded. The media members to the left of Schmidt were busy looking at their smartphones, making sure it was good. That grouping and most of the crowd knew Covington had it prior to the officials’ call. Across the way, there was Penguins coach Jerrod Calhoun. His shirt was soaked as if played the game himself. The air conditioning was not on in the Beeghly Center, making the building open in 1972 (with very little noticeable changes), a virtual sauna. He couldn’t get his players and himself hydrated soon enough after this game which put the Penguins (9-16, 5-7 Horizon League) in eighth place in the league. The top eight in the league standings after the regular season make the tournament. “I thought it was really, really hot,” Calhoun said. “Waiting on that 10-second monitor to see if that shot was good, I was ready to find the nearest trash can and vomit. He told Quisenberry from the sidelines to pass out to the wing. Devin Morgan, who had a game-high 21 points, made one of his five 3-pointers with 3 minutes left for a 62-57 lead. Milwaukee (9-15, 4-7) countered as DeAndre Abram had 3 and Amir Allen’s three-point play put the Panthers ahead 66-64 with 1:09 left. Abram and Allen each had 13 points. Morgan then tied the game on a jumper with 50 seconds left, but Allen’s layup put Milwaukee up 68-66 with 26 seconds remaining. Then, Darius Roy, who had a team-high 20 points for Milwaukee, made two free throws with 12 seconds remaining. Four-point lead for the Panthers at 70-66. This is a YSU team which found how to close out games at Oakland and Detroit, winning in the last 4 minutes. The leadership of Bohannon, who had 15 points and 11 rebounds, was instrumental in this game and in past contests. It was prevalent at Detroit and Thursday. “My MVP was Naz Bohannon because I heard him throughout the whole game,” Calhoun said. “I heard him in huddles. I heard him on the floor. They were resilient for the third straight game, not deterred being down four with 11 seconds remaining. Quisenberry quickly drove the length of the court, was fouled and made a three-point play with 7 seconds left. Covington fouled Roy on the inbounds. He missed the first free throw and made the second. Enter Quisenberry, who was held to eight points, about half of his Horizon League average. His play-making ability helped these Penguins secure yet another win. Not a surprise to Calhoun. “To shoot 3-for-12 and 0-for-7 from 3 and then go make the game-winning play, that’s why he’s going to be good.,” said Calhoun, whose team hosts Green Bay (12-12, 6-5) Saturday at 6 p.m. These Penguins want to continue this winning streak and keep climbing up the Horizon League standings. YSU is two games out of third place. “Right now it’s a boost of confidence for us,” Morgan said. “We’re trying to keep the city involved and fans to come out. We’re finally getting over the hump. As a group we’re maturing down the stretch.